Well, this weekend, it was HOT! If any of my non-Canadian readers still believe that Canada is a place of perpetual ice and snow, this weekend my part of Canada hit temperatures in the high 30s Celsius which is around 100 degrees Fahrenheit! That's hot no matter where you live. Normally our summer temperatures are in the eighties and nineties, but hitting one hundred this early in the summer broke a few records! We have central air conditioning and that kept it quite comfortable, however. We also had to pick our cherries. We have one cherry tree but it produces almost 200 pounds of cherries each year. Once they're picked we begin the process of finding homes for them all, since we can't begin to eat or preserve them all. But one nice part of the weekend was a surprise birthday party for a friend who is also one of my downline! Her hubby had everything planned and we spent a warm, but enjoyable evening at a BBQ in her honour. 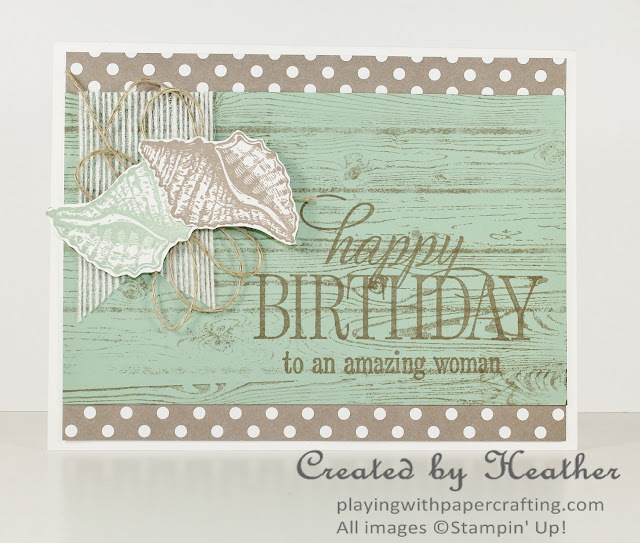 I needed a card for her and I used the Freshly Made Sketches Challenge sketch for the layout. I used the Host Set, Happy Birthday, Everyone for the first time, and I love that Happy Birthday sentiment. The great thing about this stamp is that you can pair it with one of the other six sentiments to make your card much more personal. In this case, I chose "to an amazing woman" because my friend is amazing! She is funny, personable, incredibly organized and a very hard worker! I'm so honoured to be her friend! 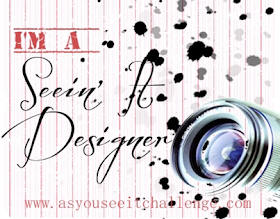 As you can see, I flipped the challenge sketch and used the seashell from By the Tide Stamp set for the shape. 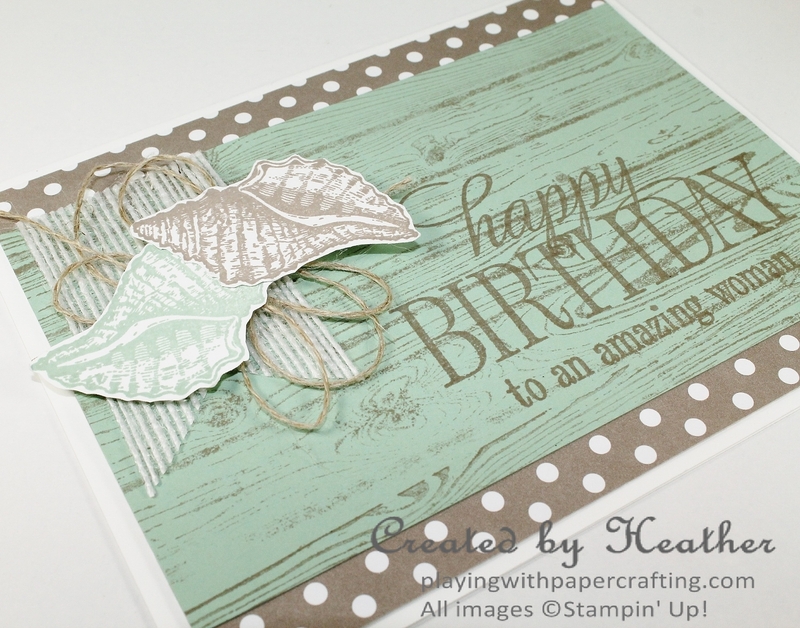 I've always liked the Hardwood Background stamp when it is stamped in brown on Pool Party paper. This time I used the new Tip Top Taupe ink for that job, but stamped it off once before stamping on the cardstock so it wouldn't compete with the sentiment. The sentiments, from Happy Birthday, Everyone, are stamped full strength in Tip Top Taupe, as well. 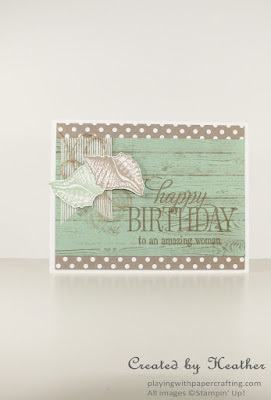 I love the muted effect of stamping it in the same colour as the background. 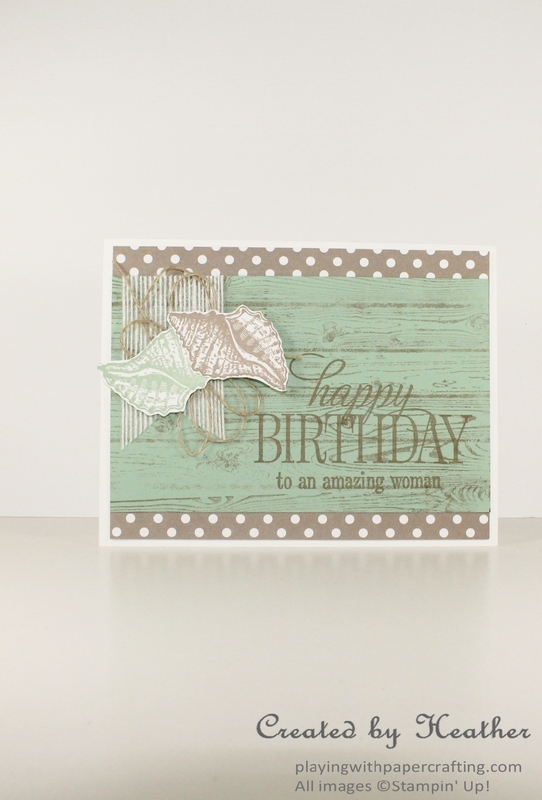 The background DSP is from the In Colour Designer Series Paper Stack in Tip Top Taupe. Those Colour Collections are so worth your money. 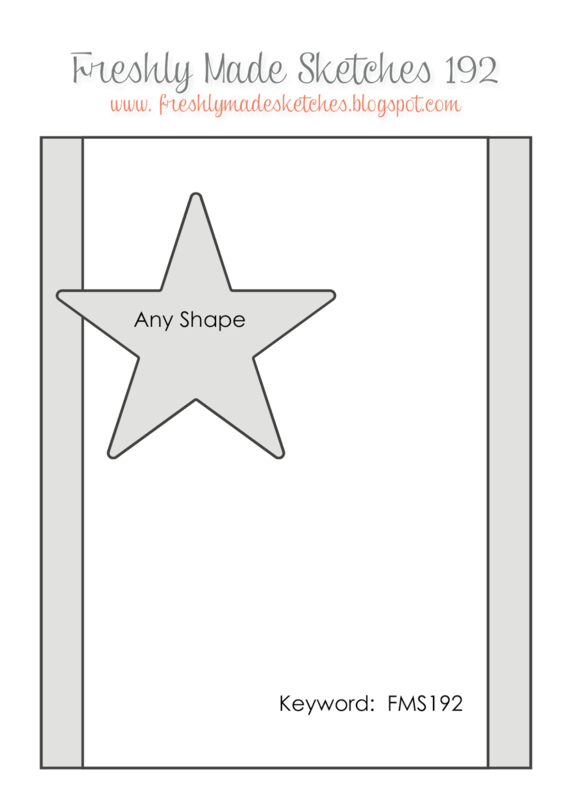 You'll never lack a background DSP in any colour if you collect each of the colour collections. Purchase one a month to stretch out your budget a bit. 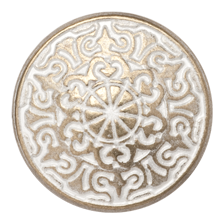 Right now the Regals and Neutrals collections can't be ordered as there was a sizing issue, but that will be corrected soon and you'll be able to get them. I stamped the seashell from By the Tide in both Pool Party and in Tip Top Taupe and hand snipped both of them. I added them to a bit of the White Jute Ribbon, cut into a flag, and some loops of Linen Thread. This card was perfect for the job and well received by my friend! 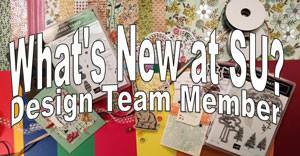 Well, I finally have my retired products inventory ready for you to look at and purchase! 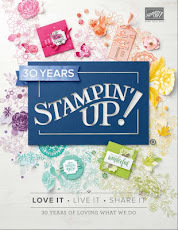 Every year, to make room for new products, Stampin' Up! retires some of it's current inventory. 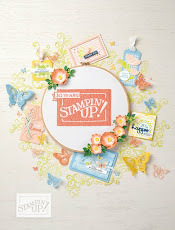 As a demonstrator, it makes no sense for me to continue to demonstrate retired products when my customers can't purchase them from Stampin' Up! so I sell my products at a reduced rate. 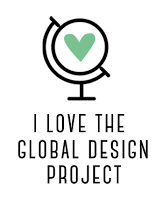 There are two ways to buy my products. One is to pay the slightly discounted price and then get 50% of that price in free new product of your choice. The other way, if you don't want free new product, is just to pay the 50% price that you would have otherwise got in free new product. To purchase any of these items, send me an email at hcooper52@gmail.com and I will send you a PayPal invoice for the items of your choice. It will include the cost of the items and a shipping fee. If you live close to me, I can deliver without the need for the shipping fee.